Arbitration in Romania: A Practitioner’s Guide provides international users with information on Romanian arbitration law and practice. Two very practical considerations have generated such need. On the one hand, there is a sizeable part of the international arbitration community confronted with arbitration cases connected to Romania (for example, as far as investment arbitration is concerned, Romania has so far faced twelve cases, each of them raising very interesting legal issues). On the other hand, there is a certain discrepancy between the current international perception on the status of arbitration in Romania and the actual situation, which relegates the country to a rather obscure position. 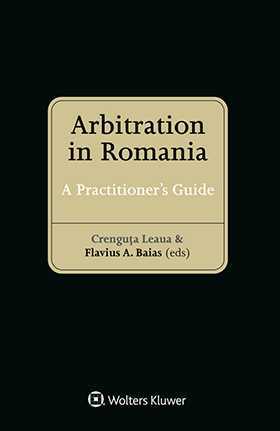 This book aims to widen international practitioners’ knowledge on Romanian arbitration law and practice thereby providing an opportunity to gain insights into key concepts, such as investment and arbitral proceedings, arbitral institutions, recognition and enforcement, arbitral awards, mediation, disputes, choice of law, etc. The detailed presentation of the current legal framework by the Romanian practitioners offers perspectives on aspects of arbitration in Romania and also provides important information on the development and current status of arbitration in Romania. the role of Romania’s Dispute Adjudication Board. All contributors refer to relevant case law. Annexes present important primary texts, including the rules of arbitration of the Court of International Commercial Arbitration attached to the Chamber of Commerce and Industry of Romania (CICA – CCIR). This book presents the first detailed presentation in English of the current legal framework applicable to arbitration and other alternative dispute resolution methods in Romania. If one looks only at the statistics of the ICC in the last years, it can be seen that Romanian law has reached the top ten applicable laws and Romania as a place of arbitration is also frequently mentioned. This book acts as a springboard for international practitioners to understand the nuances of arbitration practices in Romania. The information provided is of great value to all practitioners –helping them to confidently handle cases which entail the application of such laws, and to counsel for companies registered in Romania by foreign investors.